Whether you're a professional photographer or a newly introduced hobbyist, you share the sentiment of photographers everywhere who want their photos to look, well, picture perfect. So you must hate it when a smudge on the lens causes your beautiful shots to look like a newspaper clipping... 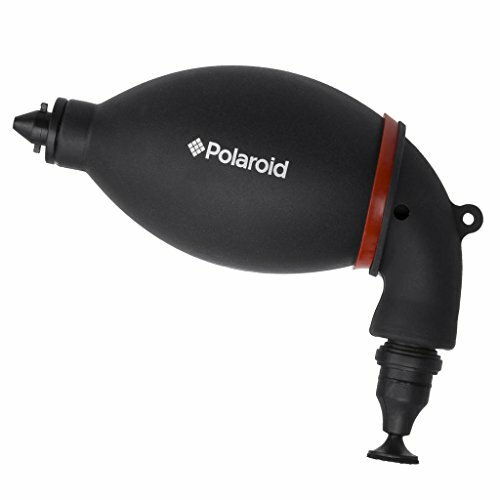 Enter the Polaroid lens pen with its integrated air blower. While these two tools are available on the market separately and are used by thousands of camera-people worldwide, our clever design combines them in a single device that evokes the shape of a hippocampus. On one end you'll find a hard plastic cover that protects the lens pen from dirt, dust and other camera no-nos. Pull it off, and the portion that represents the sea horse's tail features a circular pad measuring about half an inch in diameter. The pad is covered with a fibrous material that excels at removing fingerprints, dust, smudges and more from glass and plastic surfaces. Use it in a gentle circular motion to clean camera lenses, viewfinders and screens. It works every time, and will never scratch any delicate surfaces or expensive equipment. The "belly" of the hippocampus is made of a squeezable rubber bulb that acts as the air pump, and is ergonomically shaped for easy pumping with either hand. The second end sports a small point with a pinhole opening. That's your air outlet for blow-cleaning camera lenses, viewfinders, screens and even wind filters. What's more, you can easily pop out the plastic adapters at both ends to remove them from the hippocampus body. Switching them around will allow you to choose between a straight-tipped air blower and an angled blower tip. This is really useful when working with advanced pieces of equipment that have hard-to-reach areas.